Secretary Bird Landing - Roger and Pat de la Harpe Photography - Photographs, Video and Stock Images. We recently returned to Nkomazi Game Reserve in Mpumulanga, South Africa to shoot more stills and movies for them. On this occasion we concentrated on shooting wildlife to support the largely lodge and guest activity images we had captured previously. The wildlife pulled out all the stops and we captured great images of lion (including mating), elephant, leopard, waterbuck, impala, wildebeest and babies galore. 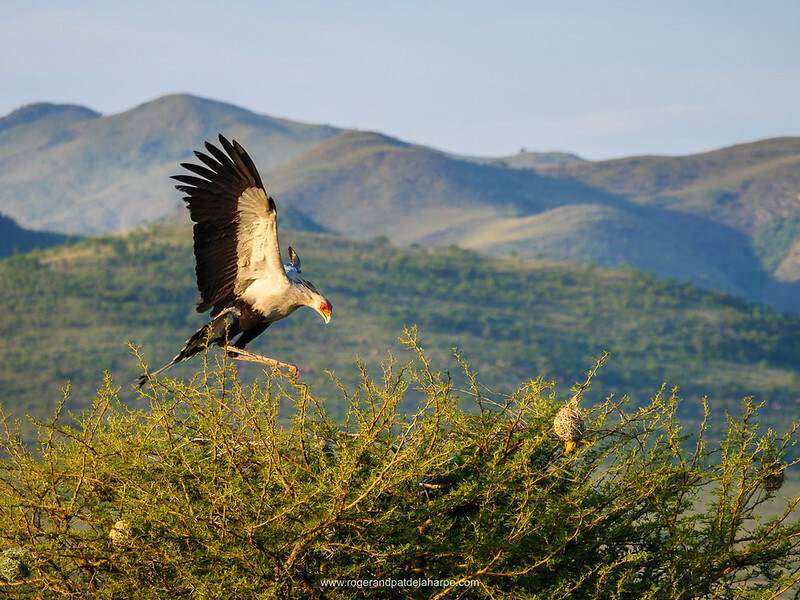 One of the highlights - a secretary bird flying up to its nest with 2 chicks in it. We managed to get stills and slomo movies of it (Pat on stills and me on movies - both with Panasonic GH5 cameras). Behind the scene though, it took us almost 2 hours to get the shots! We'd seen the female pacing up and down nearby, feeding as she went. And we knew that sooner or later she would have to fly back to the nest to feed her young. We just had to wait it out... The huge plus to the waiting was that the longer she took, the better the afternoon light got.